If you are a football fan here in Denver, you likely tuned in to the game on October 9th against Atlanta and noticed the annual NFL Breast Cancer Awareness campaign was in full swing, with players wearing special gear that will later be auctioned off to help the campaign. Like many home viewers, you probably watched the halftime report and may have missed a big change on the field this year as the Denver Broncos debuted a new cancer-awareness campaign. 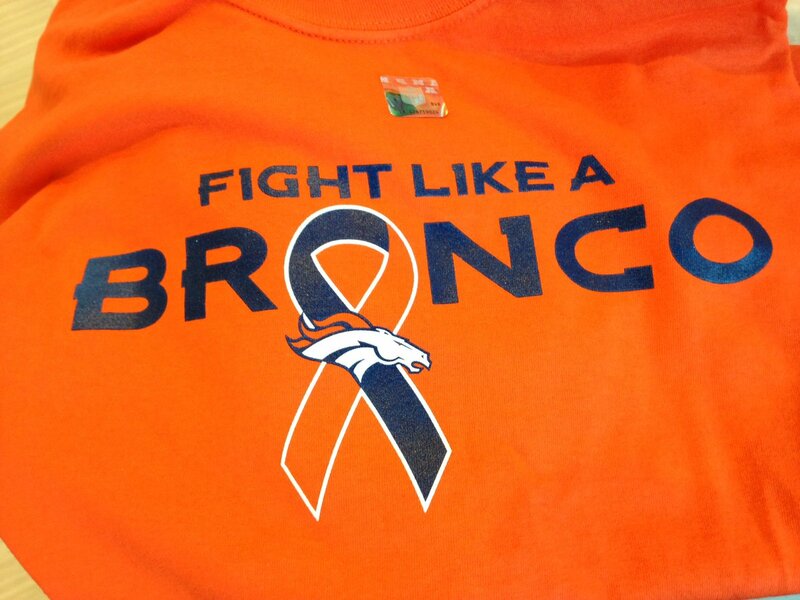 While the whole country is acknowledging the importance of breast cancer awareness, and the NFL still has it’s “Crucial Catch” campaign for breast cancer awareness and prevention, the Bronco’s officially expanded the scope of their interest this year by doing the first “Fight Like a Bronco” campaign, which is intended to show the organization’s support for all of the brave men, women, and children who battle any form of cancer. Broncos Charities made a $20,000 donation in honor of breast cancer survivors to Susan G. Komen Colorado in addition to two separate $20,000 donations to the American Cancer Society directed to support efforts for pediatric cancer research and colorectal screening. The celebrated cancer survivors were treated to a special pregame brunch where Denver Broncos President & CEO Joe Ellis addressed the group. Survivors were invited through the Broncos’ season-ticket holder base, partnerships with Susan G. Komen Colorado and the American Cancer Society, an online nomination process at DenverBroncos.com and through corporate partners UCHealth, Children’s Hospital Colorado, King Soopers and U.S. Bank. This is not a move on the part of the organization to distance itself from Breast Cancer Awareness or the Susan G. Koman Foundation, but rather an opportunity to remind Bronco Country that there are other cancers impacting countless lives, and all are worthy of our concern as well as additional research dollars. At Catch it in Time, we were honored to be asked to be there for the celebration at half time. One of our crews was down on the field capturing the excitement as 125 VIP survivors celebrated their lives, their wellness, and the quest for the cure, to which they are entirely devoted. We will have the highlights pulled together soon and will share more when they are available. As we often say here at Catch it in Time, starting with awareness is critically important. Uncertainty and denial are often what causes the greatest fear. We are always surprised when we hear of people NOT getting their screenings because they have the “I just don’t want to know” attitude. We also hear the “something is going to kill me anyway” response from those avoiding tests. Efforts by the NFL and the Denver Broncos and groups like our good friends over at Team Draft, who focus on non-smoking lung cancer, are vitally important for many reasons. For one, they remind us that cancer can strike anyone. Status, fame, or wealth cannot stave it off. Most importantly, it reminds us how much is treatable and curable if detected early. This is yet another reason we are big Bronco fans here at Catch it in Time – with the exception of one Oakland Raider fan in the office – and we salute the Broncos for taking the NFL campaign one step further in the hope that everyone will Catch it in Time!